MUFE's Arty Blossom Eyeshadow Palette, part of its Spring 2013 collection, will be launched in Singapore on 9 January. I do believe this is one of the first few products for Spring we are getting in here! Of course, Singapore is pretty much hot and humid all year round, so I suspect that for us "Spring" is really more synonymous with "Chinese New Year" than any real turn in the weather. Which is why I'm more than happy to welcome the Arty Blossom Palette as my first Palette for Spring! It's too early to say this is my favourite eyeshadow palette this season, since truthfully this is the only Spring eyeshadow palette I've tried, but the MUFE Arty Blossom Palette certainly sets the bar high. You guys know I've always been a fan of MUFE due to their great range of colours and consistent quality, and this palette is a win in multiple ways. It is pretty and feminine, in contrast to last year's Technicolor palette, which was bolder and brighter, but still lots of fun. First, there is the packaging. 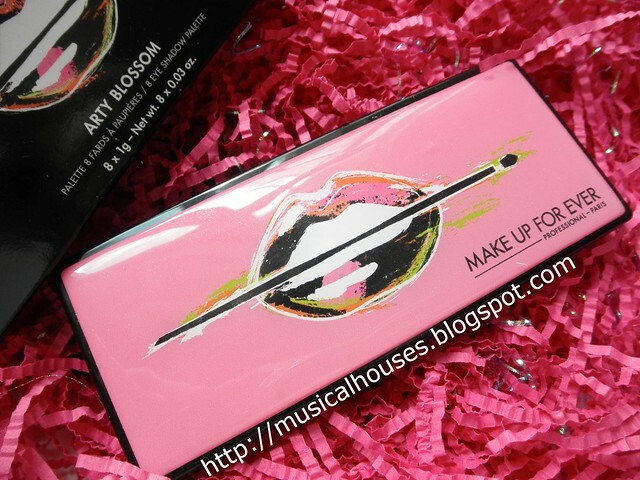 Most MUFE palettes have a black metal casing with some print on top, but this one has a pink plastic top, with an illustration of a multi-coloured lip and paintbrush in Spring-y colours. The inspiration came from the soft, romantic watercolours in paintings, but it doesn't copy the aesthetic from the inspiration wholesale. MUFE's twist on the product is fresh, fun, and feminine all at the same time. Definitely a twist on the usual girly-stuff-and-flowers-themed products that come out for Spring. The pink casing of the MUFE Arty Blossom Palette is both girly, funky, and romantically Spring-y all at once. Packaging aside, the colours are really gorgeous and Spring-like. MUFE has really hit the nail on the head this time - the palette balances the romantic, soft inspiration with MUFE's own artistic aesthetic - the colours are girly but not subdued, bright but not neon, and romantic but still fun. The result is a range of mid-tone colours in some Spring-inspired shades, like pink, green, and blue, that pack some punch, as well as some wearable warm neutrals. The texture and application of the shadows were also fantastic - these were smooth, well-pigmented, and glided on without any fallout or issues. It has shimmer, rather than glitter (such as the discrete glitter found in MUFE's previous palette, the Midnight Glow Palette), and generally the shadows give off a satin-y feel. 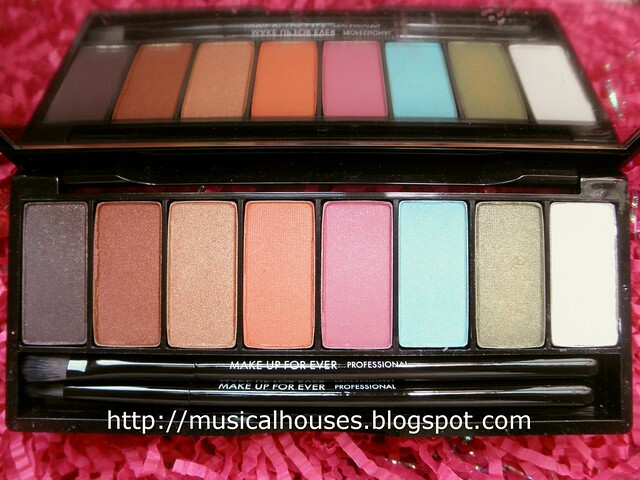 The colours of the MUFE Arty Blossom Palette are a mix of girly, funky, and romantic. And of course, swatches! With the exception of two shades (which are numbered in the swatches below), every colour in the palette is unique to the palette. And the palete is limited edition. So even if you're a palette collector (which I can be sometimes), at least you know you're still getting a range of new colours. Most of these shades have shimmer in them, but the shimmer is fine, and not particularly obvious when swatched. 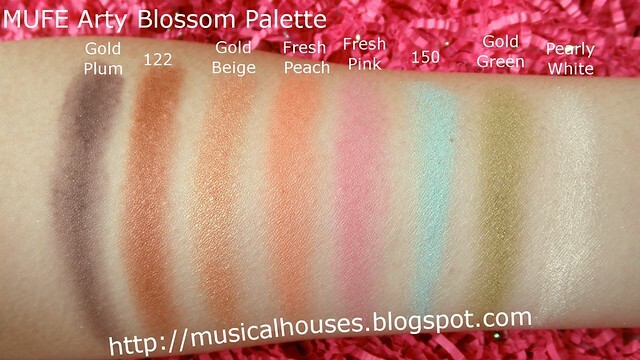 MUFE's Arty Blossom Palette swatches. Gold Plum is a purply-brown with small bits of discrete gold shimmer. Very pretty, and one of my favourite shades in the palette. 122 Metallic Copper is a permanent shade, and it is a warm copper with a nice shimmery finish. It's pulling a bit orange on me, but that's more a function of my skintone. On someone with a warmer skintone, it'll look more brown. Gold Beige is also a warm gold shade, which is again pulling orange on me. Darn all these warm-toned shades. It's gold with some copper mixed in to my eye. It has the same shimmery finish as 122 Metallic Copper. Fresh Peach is a warm peachy shade, that gives a pop of colour without being either too pastel or too bold. There is slight shimmer in the pan, but it is very minimal when swatched. Fresh Pink is a very pretty mid-tone pink, that again gives a pop of wearable colour. Sometimes pinks for Spring can be on the pastel side, but this one is more of a medium pink. Like Fresh Peach, there is some shimmer in the pan that translates minimally on the eye. Gold Green is a pretty grassy green with gold shimmer. 122 Metallic Copper, Gold Beige, and Gold Green are the three shades in the palette with stronger shimmer. Pearly White is a white with a pearly, shimmer finish. Again, there is shimmer in this colour, but it is slight. In short, the MUFE Arty Blossom Palette is a palette with great colours for Spring, but the warm neutrals in the palette such as Metallic Copper, Gold Beige, and Fresh Peach mean that even after Spring is gone, those shades are still carry you into Fall and beyond. Its colour selection makes it fresh yet it's still versatile, and its overall quality is pretty impressive as well. If you're looking for a good quality Spring palette that will also serve you well past the season, this is worth checking out. The Bottom Line: Romantic, Spring-y colours and great all-around quality make this palette a winner. I like everything about this! The packaging is really nice and so are the colours! OOOO this palette looks nice but maybe mroe for profesiional use than normal everyday use. wow the pigmentation is awesome !! I'm totally in love with the Gold beige and Fresh Peach. Such pretty colours. @zibbieko: I agree, prices here are not always cheap, particularly for foreign brands. I do think MUFE has good products on the whole though.